Brandon Steiner (bottom left) hopes a Jackie Robinson glove will bring $1 million in his "Ground-Breaking Auction." The buzz about the movie 42 was growing and the upcoming anniversary of Jackie Robinson’s Major League debut on April 15, 1947, only added to the excitement. Hollywood’s take on the baseball pioneer’s story was ready to hit theaters and the number “42″ was creeping into everyday conversation and the mainstream media. On MLB’s special day in 2013 every Major League player would be wearing number “42″ in honor of Jackie. Enter Brandon Steiner, the founder and CEO of the successful Steiner Sports Memorabilia company, the leader in the “hand-signed and game-used” memorabilia industry having partnerships with the New York Yankees and Major League Baseball. While the bulk of his business revolves around current stars Steiner recently ventured into the world of high-end vintage memorabilia and helped fatten up the college fund for Don Larsen’s grand-kids by selling the actual uniform Larsen wore for his “Perfect Game” in the 1956 World Series. The perfect Yankee pinstripes fetched a cool $756,000. A glove attributed to Jackie Robinson is included in the HOF collection (left) and is featured on a 2013 Pannini baseball card (right) endorsed by MLB and the Hall. Steele’s observation was more revealing than she knew for in Cooperstown, New York, another Rawlings baseball glove attributed to game use by Robinson was sitting in a museum display case at the very same Baseball Hall of Fame she had referenced. In fact, the Panini card company (formerly Donruss) had just issued a trading card set featuring select Hall of Fame artifacts including Robinson’s mitt identified as the “Glove Used During The Official Game” on April 15, 1947. Steiner claimed on ESPN's "Mint Condition" and FOX Business News that the Robinson glove was "game-used" in the 1955 and 1956 World Series. On FOX a Steiner VP said the glove was "unequivocally" Robinson's glove. Although the TV hosts were asking relevant questions about whether the glove was authentic, none of them asked where the glove actually came from. Where had this historic lump of leather been for the past half-century since Dem Bums finally became World Champs in 1955? What was the real story? Glove collector and expert Dennis Esken (far right) told Sotheby's that Barry Halper's alleged "circa 1960" Mickey Mantle glove they sold was made years later in 1964 or 1965. Esken's claim appeared in a 2003 NYDN article about the same misrepresented Mantle glove that Billy Crystal paid $239,000 for. The primary source claiming that the glove was actually game-used by Robinson was Dennis Esken who is listed in Steiner’s lot description for the glove as the “lead Glove Authenticator.” Esken has been collecting game-used gloves for decades and has been identified by the Daily News in other reports as “one of the nation’s top glove experts.” In 1999, Esken made waves when he showed up at the Sotheby’s sale of the Barry Halper Collection and informed auction consultant Rob Lifson that a lot sold as a “circa 1960″ Mickey Mantle glove was actually manufactured as late as 1964. Esken says Lifson dismissed his claim as “just an opinion” having sold the glove to actor Billy Crystal for $239,000. But Esken says, “I told him it was a fact, not an opinion. He just didn’t want to hear it.” Several years later Rawlings senior glove designer Bob Clevenhagen backed up Esken’s claim when Crystal called him asking what year his Mantle glove was manufactured. According to the New York Daily News, Clevenhagen told Crystal that the glove was”Made no earlier than 1964 and most likely used in 1966.” The episode bolstered Esken’s credibility as an expert in the murky waters of memorabilia authentication. But Esken isn’t just an authenticator, he’s a collector who has authenticated gloves in his own collection attributed to Mickey Mantle in 1956 and 1961, Yogi Berra in 1960 and Roberto Clemente in 1968 . Esken loaned his 1956 Mantle World Series glove to the Hall of Fame where it was on display for five years and recently loaned his 1961 Mantle glove to the Yankees who exhibited it in their museum for a year. Esken’s public display of his gloves at the Hall and Yankee Stadium has also bolstered his profile and likely contributed to his being chosen by Steiner to authenticate its Jackie Robinson glove. Or not. 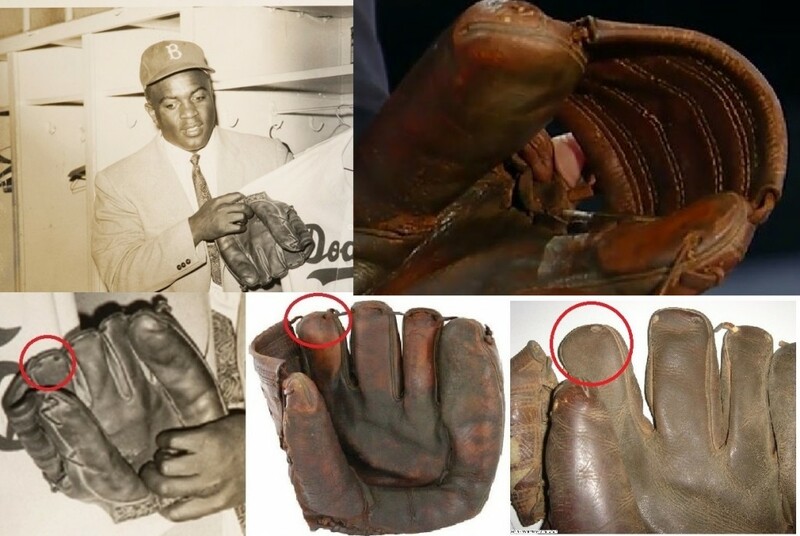 In 2012 American Memorabilia claimed that a 1956 photo of Jackie Robinson (top left) showed him holding the same glove they were selling. But a photographic comparison of the glove in restored and unrestored form (bottom, far right and center) reveals the glove has one punched hole in its index finger while the one in Robinson's actual hand has two (bottom far left). A view of the glove from FOX Business News shows one hole on the inside and another on the outside of the glove. The photograph posted by the auctioneer was a famous image of Robinson packing up his equipment at his Ebbets Field locker after being traded to the New York Giants in December of 1956. Robinson is holding what appears to be a Bob Dillinger Rawlings model glove similar to the auction lot. In essence, the auction house was claiming that Robinson was holding their glove and that it was his last. But a close examination of the glove in the photograph as compared to the actual glove American Memorabilia was selling reveals definitively that both gloves are, in fact, not the same. The interior side of the index finger on the glove pictured in Robinson’s own hand clearly exhibits two punched holes for the glove’s lacing while the American offering exhibits just one hole. It’s an anti-photo match. The glove didn’t sell in the 2012 auction failing to receive an opening bid at the reserve price of $75,000. Now, one year later, the exact same glove appears in Steiner’s auction with a minimum bid price of $42,000 and already has a current bid of $310,835 with only three bids having been placed. The chain of events has several executives in the auction industry scratching their heads. How’d this happen when there isn’t even one visible “photo-match” posted on Steiner’s website which advertises the glove as the one Robinson used in his “Final Season and 1955 World Series.” Steiner also indicates that the reserve price set on the lot has been met. Robinson is shown wearing a Rawlings BD model glove in several images shot in 1956 by Hy Peskin (left) and others which are undated (middle, right). Teammate Don Zimmer (right) says that players used several gloves each season. 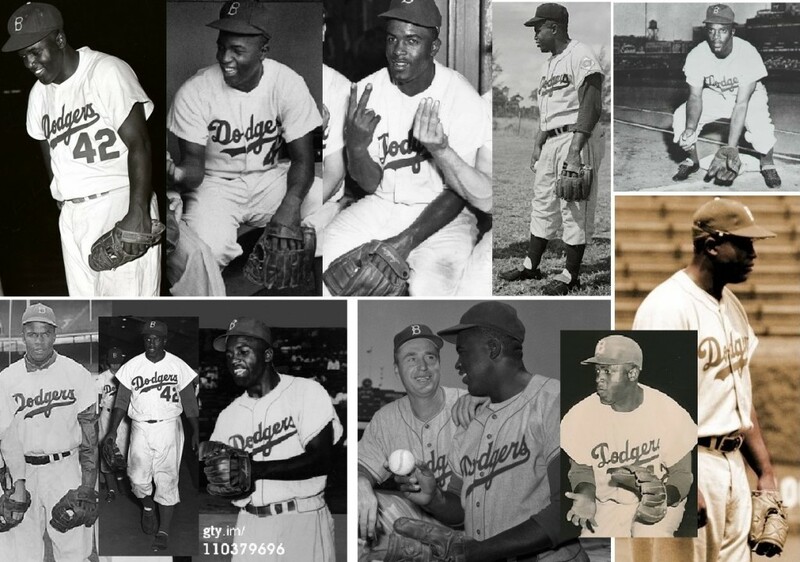 Taking the claims of Irvin and Zimmer on face value it would seem prudent to research existing photographic evidence of Robinson wearing baseball gloves in 1955 and 1956 in order to support the rather lofty claims made by Esken and Steiner who also claim to have other photos available showing Robinson wearing the glove. This Lelands auction lot shows an original wire photo showing Robinson before Game 1 of the 1955 World Series wearing a glove with an "open-web" contrasting the glove being sold by Steiner Sports. Surprisingly, some Internet sleuthing quickly yielded a Lelands auction lot offered in 2006 showing Jackie Robinson and his teammates wearing their gloves just before Game 1 of the 1955 World Series. (Another search yielded a second current offering on eBay which reveals the photo was published just six days before Game 1 of the 1955 Series.) As can be seen clear as day, Robinson is wearing a glove with an open web unlike the Steiner glove which features a Rawlings closed “solid-V-Anchor” web. Robinson played Game one through Game 6 at third base for the Dodgers but was benched by Walter Alston in the deciding Game 7. Like Zimmer stated, its possible Robinson used this glove for play at a particular position during 1955. So, how could a definitive claim be made that Robinson wore the Steiner glove in the Fall Classic? Taking it a step further, a review of the 1955 MLB World Series Video reveals several scenes featuring views of the actual glove Robinson was wearing on the field during actual games. At 10:08 of Game 2 in the video Robinson is shown wearing a glove with a web similar to that of the Steiner offering, but at the end of Game 3 and at 17:38 of Game 4 Robinson is shown wearing a full, closed web that differs from the Steiner glove. None of the views from the 1955 Series match the glove that Robinson posed with for the news photo published on September 22, 1955. If this exercise proves anything it’s that claims for a glove’s game-use need to be backed up with sufficient visual evidence and that players used multiple gloves during the course of a season and even in a single World Series. To date no film or video clips definitively show the Steiner glove on Robinson's hand in the 1955 or 1956 WS. The clip to the left shows his glove at the end of Game 3 in 1955 and the screen shot of the film to the right shows him holding his glove at Spring Training. That being said, the Steiner website provides very little to support their “photo-match” claims for the glove they hope will realize upwards of $1 million at auction. The only visual given is a scan of a page headed: “Dennis Esken-Glove Authenticator-The Ball-Stops Here,” which states the World Series game use and includes two very small undated images of Robinson wearing his glove at Spring training in Vero Beach, Florida. We called Steiner numerous times for the past few weeks requesting its alleged “photo-match” evidence, but received nothing. After contacting Victor Moreno at American Memorabilia, we were referred to Dennis Esken who provided us with larger files of the two images he claims prove that Robinson actually wore the Steiner offering. The overall basis for his claim is the number “42″ written in black ink on the right side of the glove’s strap to the left of the Rawlings label. (The glove was missing its original Rawlings label so Esken attached a makeshift replacement patch “for aesthetic purposes.”) Esken claims that the glove Robinson is wearing at Vero Beach depicts the same handwritten “42″ that is found on the glove strap of the Steiner offering. The enlargement he provided showed a “42″ placed in what appears to be the same section of the glove as the Steiner glove. The owner of the Robinson posted this message at CollectorsWeekly.com under the name JRMemorabilia when the Robinson glove was open for bids at American Memorabilia. Still, even with the most solid provenance from the player himself or his family, it is extremely difficult to actually prove a specific player ever used a glove on the field in an actual game or for a certain period of time. Unless a glove has a particular mark or imperfection that is readily identifiable, like the written “42″ on the Steiner glove, it is tough to distinguish iron-clad authenticity. When Steiner sold Don Larsen’s Perfect Game jersey last year the authentication involved comparisons between the pinstripe alignment of the jersey against photos of Larsen from the game in 1956. Every point of analysis was a match. It was the opposite outcome of a situation that arose last month when Haulsofshame.com broke a story about the million-dollar jersey alleged to have been worn by Reggie Jackson when he hit three home runs in Game 6 of the 1977 World Series. Although the jersey was consigned by Jackson, himself, the pinstripe alignment was not the same as what appears on the Game 6 video of Jackson hitting each home run. Sports Cards Plus, which featured the jersey on the cover of its catalog, pulled the jersey from the sale. As stated, gloves are more difficult to identify on the field at a certain time. The photo provided by Eskin suggests that the Steiner glove is the same Rawlings BD model that Robinson used and has the number “42″ handwritten on the glove strap in a space that appears to be the same as the “42″ in the photo. But, unlike Yankee pinstripes, it is not possible to definitively confirm that both of the numbers written on the glove and this photo are the same. The angle of the photo and the resolution of the image are not enough for Esken or Steiner to say the glove is “unequivocally” Robinson’s. 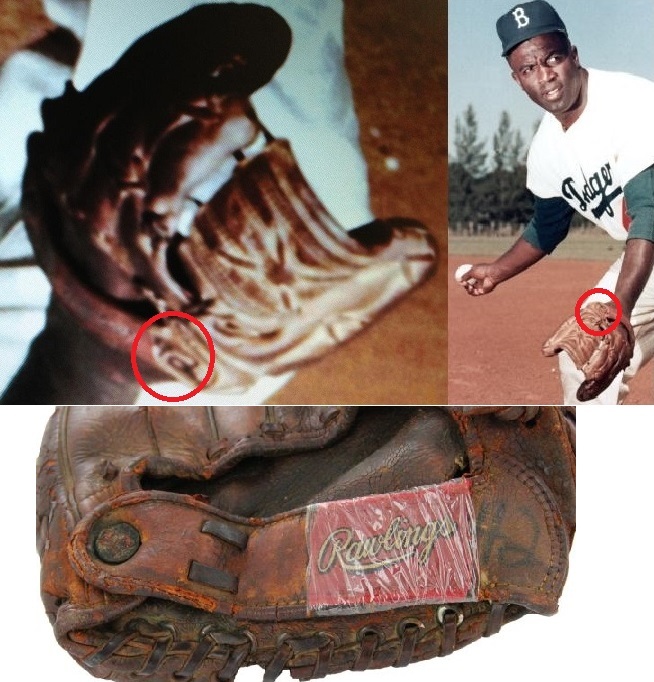 It does look like it is the same glove, but considering the secrecy behind where the glove originated, you still have to consider that someone may have tracked down the right model glove and forged the “42″ in the same spot using period photos as a guide. Based upon Esken’s own analysis, the handwritten “42″ makes or breaks the glove. But with an unverified “photo-match” from an undated Spring Training photo it is difficult to see how Steiner can claim game use in the 1955 and 1956 World Series, let alone an unequivocal claim that it was once owned by Robinson. An undated photo of Robinson in a game at Wrigley Field shows a clearer and more definitive 42 on his glove (left,top right). The 42 appears to match the number on the Steiner offering (bottom right) and the undated Esken photo of Robinson at Vero Beach (center). After reviewing perhaps one hundred more photographs of Robinson we stumbled onto Bill Burgess’ excellent website Baseball Fever and found posted what appears to be Robinson playing third base in a game wearing the exact same glove Steiner is offering. The ivy on the outfield wall reveals the game was at Wrigley against the Cubs, but at first glance all you can see is that Robinson is wearing what looks like a Rawlings model glove with an Anchor-web. It wasn’t until we enlarged the image that we realized the 42 was present and it wasn’t until we turned the image upside down that we were able to see that this 42 was strikingly similar to the Steiner offering. Without a high-resolution image of the 42 it is still difficult to reach a definitive conclusion. Burgess had no information that indicated when the photograph was taken. Placing Robinson on the field in one undated photo at Wrigley (and posing at Vero Beach in another), however, is a far cry from establishing that the same glove was “game-used” during the 1955 and 1956 World Series. 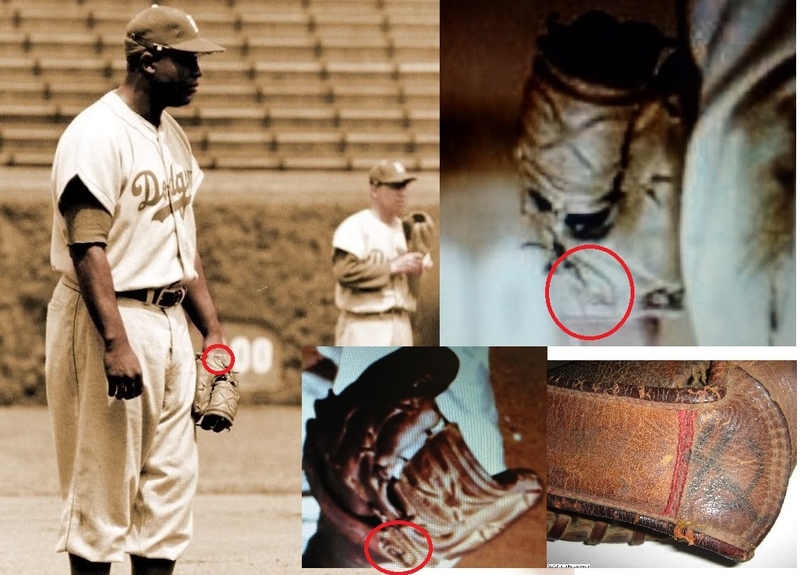 The video tape review of the 1955 Series has already revealed that Robinson wore an open-web glove in Game 2, but how could anyone ever prove it was this same glove considering how many gloves Robinson was known to use in the course of a season? Even proving that a handwritten 42 on a glove is a “photo-match” isn’t quite enough. We even found Robinson wearing another 42 glove in yet another undated photo from the same time period. A Getty image shows Robinson posing at Spring Training and resting on his knee is a glove featuring a jet-black 42 on what appears to be another Rawlings Dillinger model. When that image is enlarged and compared to the Steiner glove’s 42 it is evident that both gloves are different. Two different gloves with two different 42’s. Was this second glove used in the 1955 or 1956 World Series, too? Without verifiable proof, it is impossible to say. To say either glove was used in the World Series without providing any additional proof is a misrepresentation. You also have to consider the possibility that the Spring training “photo-match” Esken found is actually this glove and not the Steiner offering. With some more research, maybe the same 42 will be unearthed, captured on film or on a photograph taken on the field in October of 1955 or 1956. Or maybe not. 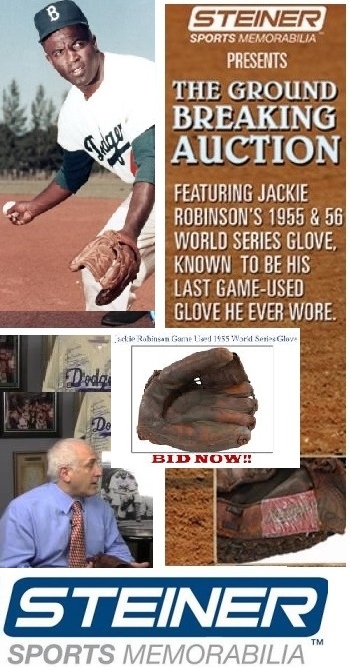 Hopefully the $310,000 bidder going after the Robinson glove won’t fall victim to a more serious surprise and a false sense of security thinking that he’s purchasing what Steiner, ESPN and FOX have already advertised as the actual glove Jackie wore when Dem Bums finally brought a title back to Brooklyn. For now, the evidence just isn’t there to support such claims. When we asked Dennis Esken if he overreached in his 2012 LOA with the claim of World Series use in 1955 and 1956 he said, “They (Steiner) didn’t ask me for anything. They didn’t ask me for the ones (photos) I had. They just want to sell it. They want to make maximum profit, that’s all the auction houses want to do.” According to Esken, Steiner didn’t conduct the photo-matching they claimed on ESPN and FOX, they just used his old LOA. Esken also said he’d send us any other supporting photos he could find. Calls yesterday to Steiner auction rep Michael Kleinman and the Steiner Media office were not returned. 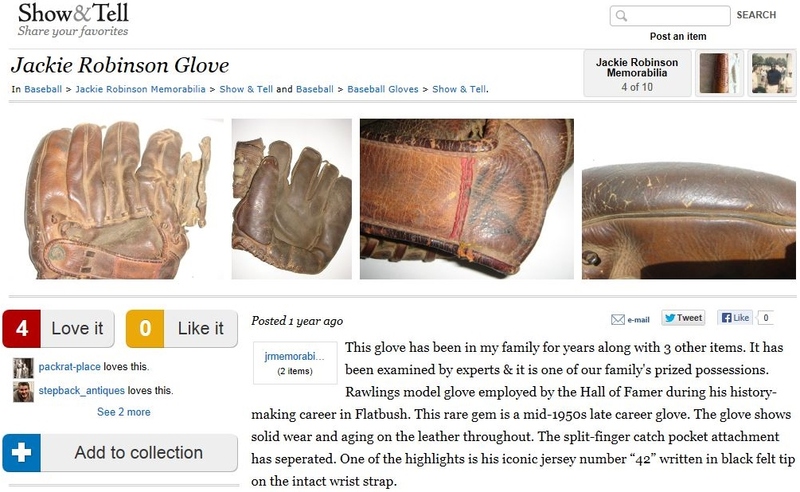 In a telephone conference this afternoon, Steiner Sports CEO, Brandon Steiner, and Vice President, Steven Costello, responded to the May 30 report published by Haulsofshame.com about the auction lot alleged to be a game used glove used by Jackie Robinson in the 1955 World Series and the end of his career as well. Both Steiner and Costello stated that they relied solely on the expert report issued by Dennis Eskin and that they had not conducted their own independent authentication of the glove. Costello said, “Steiner is very committed to authenticity and we always rely on experts. We were told Dennis is the leading glove authenticator in the country.” In regards to the claim that the glove featured in the auction was the only Robinson gamer known to exist Costello added, “We called the Hall of Fame to check that and the Hall said they did not have a Robinson glove on exhibit . I believe FOX also called to check that too.” Steiner and Costello were unaware of the Pannini trading card featuring the Hall’s Robinson glove until they saw our published report. An exhibit case at the Hall of Fame (left) used to include a glove attributed to Robinson, but is not currently on exhibition. Robinson wore a first-baseman's mitt in 1947 (right). Brad Horn, a spokesperson at the Baseball Hall of Fame, was unavailable for comment and on vacation until June 3. Costello and Steiner also said they had someone in Cooperstown visit the museum today to confirm that a glove attributed to Robinson was not on display in the museum. It is likely the glove was removed from the exhibit to be photographed for the trading card. In addition to the Robinson glove believed to be included in the Hall of Fame’s collection, New York auctioneer, Josh Evans, of Lelands, also told us in an interview that he had handled another game used Robinson glove. Said Evans, “I sold a glove, the first baseman’s glove seen in the famous and memorable photo taken in Robinson’s den.” It is believed that was the glove Robinson used in his first game for the Dodgers in 1947. Over the past few decades,Lelands has handled numerous items consigned directly by Robinson’s widow, Rachel Robinson, and the Robinson estate. UPDATE (June 3): The Jackie Robinson Game Used Glove failed to receive another bid and sold at Steiner Sports “Ground-Breaking” auction for $373,000 (including buyers premium). Despite acknowledging that there was not sufficient evidence to support claims the glove was used by Robinson in the 1955 and 1956 World Series, Steiner also failed to update or correct the lot description. Steiner started the bidding at $42,000 and noted a secret reserve price was in place. After the auction opened for bidding at the beginning of May only three bids were executed and the bid escalated to $310,000 with Steiner noting that the reserve price had been met. The Steiner final price failed to pass the the prior record price for a glove sold at auction set by Barry Halper when he sold Lou Gehrig’s alleged “Last Glove” at Sotheby’s in 1999 for $387,500. 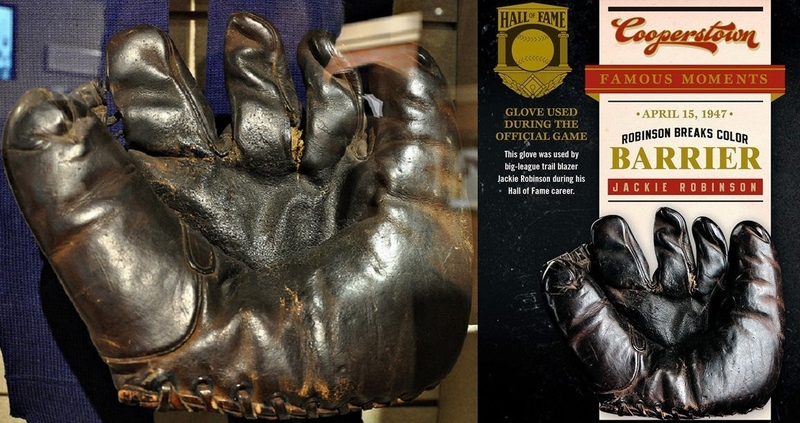 Despite Halper’s claims regarding that glove, Gehrig’s authentic last glove was on display at the Baseball Hall of Fame as a donation from the Gehrig family. Halper purchased the glove from Gehrig’s teammate Babe Dahlgren, but inconsistencies in the stories told by both Dahlgren and Halper suggest that the glove was misrepresented and a six-figure fraud. 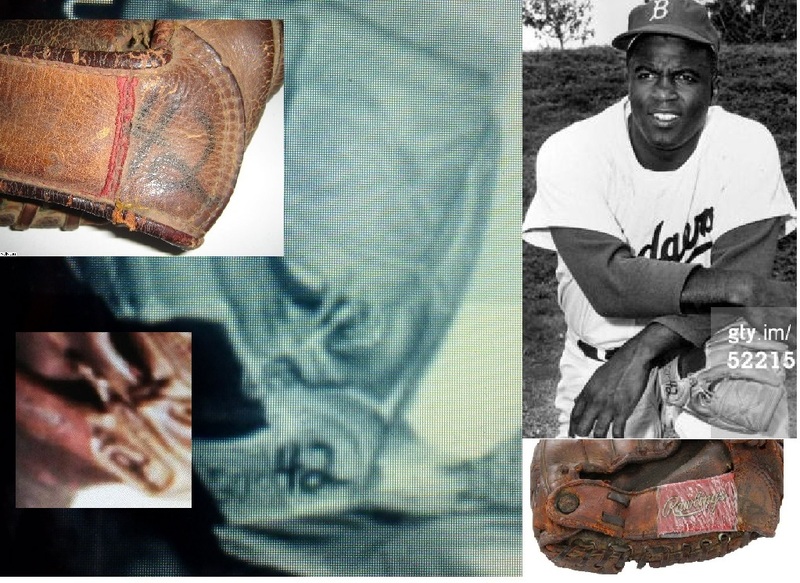 Illustrated above are excerpts from Dennis Esken's 2012 LOA for the glove he identified as being worn by Jackie Robinson in the 1955 and 1956 World Series. 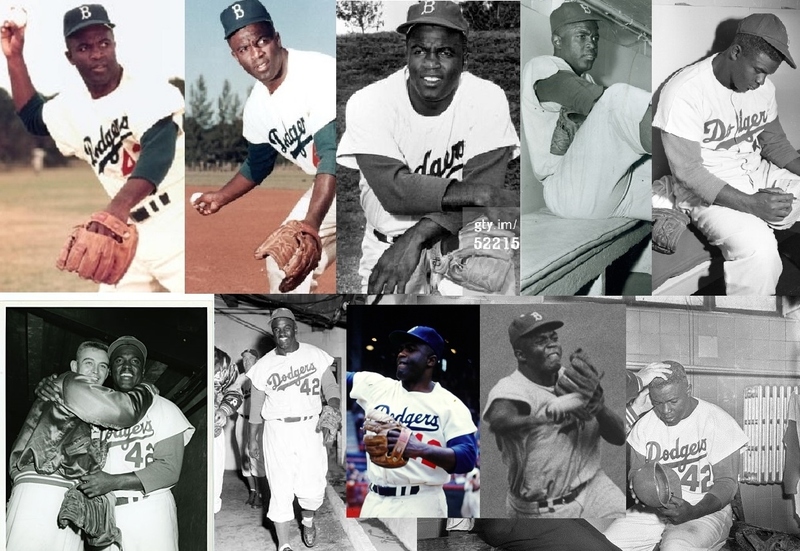 There is likely a Jackie Robinson collector who can provide more and better glove images from 1955 and 1956. I hope that he becomes aware of this issue and steps forward with images. Do we know where the Hall of Fames Robinson glove came from? His family? Not sure exactly who donated the glove, but there were numerous Jackie Robinson items included in the Halper Collection purchased by MLB and the HOF in 1998. Will have to check on that. why is the april 15, 1947 glove in the hof—opening day and jr’s debut–a fielder’s model and not a first base mitt, since jr played first base in that game? That glove is the best celebrity item since john voigt’s car. Why is esken withholding photos and info about the glove if he is the one writing an loa for it? if he is writing the loa, it is his duty to disclose everything he has on the glove. That’s what is sickening about sports memorabilia these days. everyone thinks they have super secret info and its all baloney because it doesnt help weed out the fakes from the genuine if they hide it all. Steiner doesnt have a fraudulent bone in his body. He’s also a great blogger. If he says that’s Jackie’s glove, thats good enough for me. This story also reminds me of how much Stan Musial hated blacks like Jackie. That was awesome when Steiner had people going around to blogs leaving spam comments, pretending to be normal people, and then had those same people bidding in Steiner auctions to jack up the prices. So classy. Considering Murray Chass believes in the goodness of Barry Halper also, I guess I should tell him, after his latest comment, that I have a deed for the Brooklyn Bridge that I can sell him. Are you the Murray Chass whose articles used to appear in The Sporting News and baseball magazines going back to the 1960’s? Thanks. I don’t think that baseball glove authentication is an exact science — partially because so few people collect gloves relative to jerseys, for example, and so there is little research or discussion on the internet discussion boards. I recall about nine years ago Dennis Esken claimed that Mizuno made a glove for Pete Rose in 1976 — at least two years before Rose signed a contract with Mizuno and there are any pictures or him wearing a Mizuno glove. I never accepted that claim. I don’t think that comment was left by the real Murray Chass although the commenter does include two statements he has actually made regarding Barry Halper and Stan Musial. He claims that Barry Halper never committed a fraudulent act and that Stan Musial was a racist. In making both comments he places himself second in the class of disgraced winners of the Hall of Fame’s JG Taylor Spink Award, rating only second behind alleged child molester Bill Conlin. It doesn’t look like Steiner has made any changes to the lot description for the glove. As far as photo matches go, I had the glove in my hand with the photos next to it at all angles. A far cry from looking at photos on a website. Player don’t use several gloves during the season. And, they don’t get special gloves for World Series play. Only jerseys and bats! And I haven’t been received a life time band from the HOF! Mr Esken, why not include all of the “photo matches” you used to draw your conclusion the glove is in fact the one worn in the world series by Jackie Robinson? Your lack of disclosure is yet another reason for the continued deterioration of trust by the collectors in the hobby. You state you had the glove in your hand, with photos next to it at all angles? And? I will state for the record, I wouldn’t give you a funzone slug worth one credit on a pinball machine for your written opinion on anything, short of proof that reaches far beyond an “opinion”. You are just like all the other “experts” in the hobby. One moment away from total disgrace. And I believe it’s here. Take a look at the photo that Mr. Nash posted of a lot Leland’s had of an original wire shot before game 1 of the 55 series! Wow, Jackie Robinson has an open web glove on his hand. Take a look at the glove Pee Wee Reese is wearing? Looks like he picked up Robinson’ glove for the shot wright before the game. At least Robinson’s glove made it to the field that day! First baby step for you Steve! The Robinson glove fails to receive another bid and sells for $373,000 with buyers premium added. Nope, I’m too busy discovering real photo-matched items in the hobby, like Frank Robinson’s 500th home run game worn 1971 jersey which I just plucked out of SCP. I don’t dabble in $373,000 “maybe’s” because guys like you earn a rep with a couple of obvious calls early on in your make-believe careers. People lose fortunes over blind faith. There is nothing like a photo-match. When one is found, who needs a talking head to verify what one has? Obviously Steiner spoke on YOUR reputation on the glove. And their reputation is based on 100% authenticity. How is that supported with a strong “maybe”? Again, I ask you, where is your photo matches to make such a claim on this glove? You haven’t come up with anything, except emotionally charged responses which will most certainly make the hair raise on the back of the necks of collectors holding onto your LOA’s. Denny, Thanks for voicing your recognition of my awesome basketball prowess, but let’s stick to the glove, partner. Since you seem to rely on elementary means of communication, why not take a simple approach in regards to this glove and show everyone a paint-shopped circled/lined out visible point-by-point laundry list of photo matches…you know, Denny, cross-referenced characteristics that prove your claim beyond any doubt. Something you should have done before someone laid out $373K for it. That’s something called responsibility. It’s an admirable trait that seems to have gotten lost in the daily meanderings of the human race these days. And in particular in the game used collecting authentication process. I’d be proud if someone laid down $373K on my reputation alone. But I’d also feel obligated to “earn” that rep if some evidence was presented that appears to mix fly s#!t in with the pepper, capisce there ace? What was the point of post #24? “Steve Mears” also has no affiliation with Chris Cavalier, the coward in the industry who has walked a razor-thin edge of lawlessness as he censored and removed important eye-opening posts by guys like myself who point out wrong doing in the hobby. How can he justify that? But he can “ban” forum members when he doesn’t like the exposure. And speaking of wrong doing, what does a fellow collector do for his peers when the owner of a game used memorabilia forum removes posts exposing extremely negligent “authenticating” of his personal friend? A friend claiming to be an “expert” authenticator in the hobby, no less? A friend who was taking lessor educated collectors for lots of dough by selling improperly authenticated garbage? I speak up, even if it means getting banned. That’s what good honest caring people do for each other. But guys like Chris declare his forum open for a criminal who has already been indicted by the FBI for FRAUD “…welcome to use the forum to explain”…while he muzzles collectors who call him out like I did for acts in direct conflict with the best interests of the members using the forum. News bulletin Chris: The FBI doesn’t indict because they have a “hunch” something might be amiss. But you see, Chris Cavalier had a business relationship with the indicted perpetrator of fraud on the very collectors who used the site. “Steve Mears” and his comments pointing out the obvious self-serving B.S. and therefore had to be permanently muzzled. And what does that say about Chris Cavalier? Not much. And that’s a problem. Especially when your site is supposed to help collectors “share and educate” their community. His ignorance and self-serving ways have a profoundly negative effect on collectors ability to actually learn, to be exposed and introduced to the wrong-doing. By protecting his friends and business partners who are doing things wrong in the hobby, he censors his site to a level of complete uselessness. So surely it’s easy to understand how overwhelming it must be for him to be exposed as an anti-hobby guy when you own a site that’s supposed to be serving the needs of the collectors in that hobby. So of COURSE I’m banned from his site, and I wear that silly “thread” in the link above as my badge of honor. He couldn’t handle being called out, so he turned to what every good chicken-turd coward does. He banned me. How laughable. You can’t run away from the truth Chris. It will always come out. Now can we get back to the glove? Only the last glove worn by Lou Gehrig garnered a larger bid for a game-used mitt.